Burgeoning Wolverine Star: Zone blitz: Proof of defensive... coaching? Michigan's defense didn't do much right against Wisconsin. They couldn't stop the run despite Wisconsin passing a grand total of one time in the second half, and couldn't stop either in the first half. And while some of this can be attributed to the dearth of talent on Michigan's defense, a fair share of blame needs to fall on the defensive coaching staff (per usual). 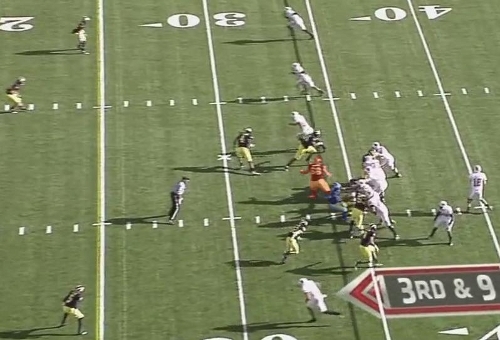 But at least once, the coaching staff designed a play to get a free blitzer on Scott Tolien. Wisconsin is in 3rd and nine on their first possession of the game. They're showing a four-wide set with a running back in the backfield to help block. 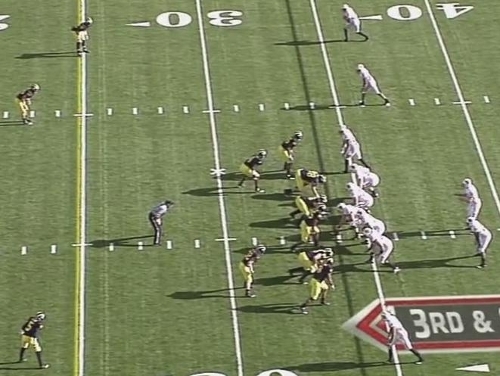 Michigan is in their 3-3-5 front and showing blitz. Thomas Gordon, Kenny Demens, and Jonas Mouton are all on the line of scrimmage showing blitz. Cam Gordon and Jordan Kovacs are both two yards from the line of scrimmage and look like they're going to blitz. James Rogers, Courtney Avery, and Ray Vinopal are showing cover-3. Immediately after the snap, all three down linemen, as well as Mouton, Demens, and T. Gordon show blitz. Kovacs is also blitzing from the second level. Cam Gordon is sitting in underneath zone coverage. A moment later, Mike Martin (red) and Kenny Demens (blue) are dropping out of the blitz and are going to settle into underneath zones. Still blitzing are both DEs (Roh and Van Bergen), Mouton, T. Gordon, and Kovacs. Most importantly though, Van Bergen (bottom of the screen) slanted into B-gap (between the offensive tackle and offensive guard), forcing both of them to block him. This helps free up two blitzers (Kovacs and Mouton) on only one blocker (the running back). You can see here that the running back has taken on Mouton, giving Kovacs a free rush up the gut. The offensive tackle realizes that he missed the Kovacs block and was successfully baited by Van Bergen. He's reaching back to get a hold of Kovacs. 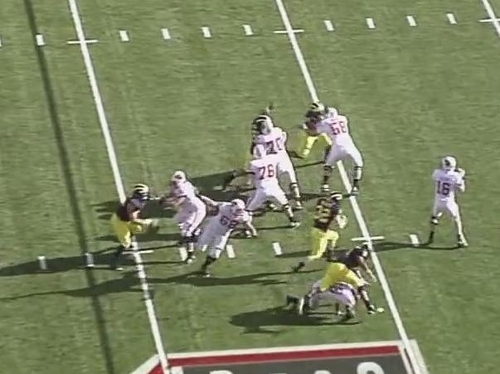 You can also see Demens and Martin settling into underneath zones just beyond the line of scrimmage. It's important to note that Michigan is rushing five men against six blockers and is still able to get a free run at Tolzien. Sacksauce. Martin and Demens are sitting in underneath zones. Mouton has pancaked the Wisconsin running back. 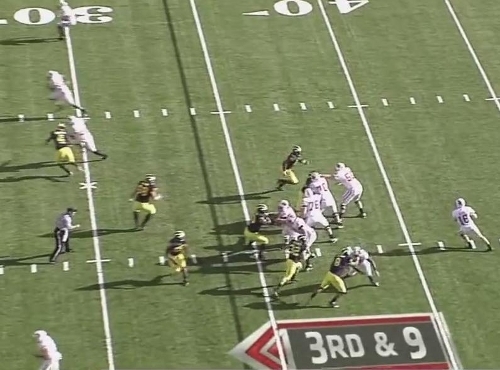 And Wisconsin is using four blockers to stop three blitzers while the left tackle is lost in space, and Kovacs has a free run at Tolzien. The defensive coaching staff deserves credit when they do something good. This is just such a play. While a lot of the defensive struggles this year can be attributed to schematic breakdowns brought on by poor play design, this is a play in which the coaching staff was able to manipulate the offensive line with a zone drop and get a free release on Tolzien despite blitzing five men against six blockers. This worked because Michigan was willing to sell out on the blitz and live with whatever happened, good or bad. The only way Michigan can realistically run plays like this is when they get teams in third-and-long situations: if Wisconsin gets a big completion here, it's just a first down, something that Michigan's base defense is unlikely to stop anyway. But given the potential that the blitz brings, this play becomes a really good call in this situation. Why the defense doesn't try similar plays more often or simply blitz linebackers more frequently is beyond me. Sitting back and waiting for quarterbacks to pick apart Michigan's defense is just as dangerous as selling out on the blitz--it should be noted that if Michigan had more talent on the defensive side of the ball, this likely wouldn't be true. 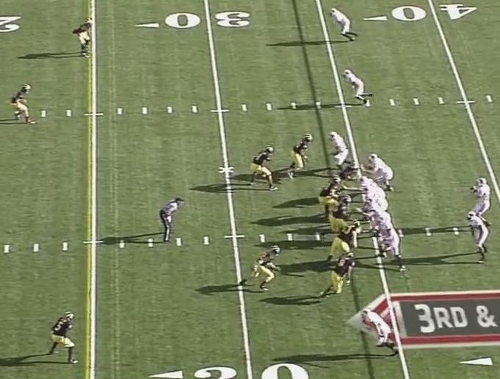 If Michigan wants a chance at beating Ohio State, running complex zone blitzes like this, and landing them, will be essential.